First thing I notice is that the mouse cursor freezes as I'm using it, then I hit the CAPS LOCK key and the LED indicator doesn't respond. Then I try the "REISUB" command, but it doesn't do anything either. Only a hard reset works, pressing down the power button for a few seconds. I couldn't figure out a consistent method. It is still random to me. Also happens under Arch Linux and Fedora. I've talked to another user on IRC who seems to be having the same freezes. prior kernel version where you were not having this particular problem? The OP reports 4.17.10-1 being the problematic kernel version. What I can say for sure is that this problem did not exist in kernel versions 4.16 and older. Yes, I can try the newest kernel, however these freezes are random and I don't know how to trigger them. I will take some time to experiment with it. Affects the latest mainline build 4.19-rc8 as well. Still cannot identify one way to reproduce it intentionally, although most of the time it happens when I have a video playing and/or multiple images being displayed with the image viewer. Hey, have you found any solution? I have the same issue and changed the default kernel now to 4.15.0-36-generic. This is working, but it would be better with the new kernel. Would it be possible for you to do a kernel bisection? The problem is, it could take days before the system freezes. I don't know how to reproduce, it simply happens. I don't even know where to start. Maybe 4.17-rc1 and so on. But that's a huge task and one needs a lot of patience to do it. I'm not sure I'll be able to. The bug in #4 is for Ryzen platforms, so it doesn't apply to Inspiron 5458, which seems to be a Broadwell platform. Please update the BIOS to A16. If you still see this issue, please attach `journalctl -b -1 -k` in next boot. I have updated to A16 and so far no freezes, although it's still not uncommon for these to stop happening for a while and then return. Hope it works so we can track this thing down. This time I was just editing the position of widgets on the xfce4-panel. I think it was around 11:45 on the clock. And I do not have a .cache/thumbnails/fail folder. There are no noticeable error message. It can be hardware freeze. Can you try 4.20-rc2 and boot with kernel parameter `pcie_aspm=off`? I also have had random system freezes ever since I upgraded from 18.04 to 18.10, Linux 4.18.0-10-generic, solved by always booting into 4.15.0-36-generic. When the freezes happen, the screen simply stops, and no input is accepted, not even the usual REISUB. "Can you try 4.20-rc2 and boot with kernel parameter `pcie_aspm=off`?" I suggest first trying 4.20-rcX and seeing if it freezes at least once. If it does, try booting for a few days with pcie_aspm=off in the kernel parameters. Post back results. I can't do that right now, because I'm not currently running Ubuntu 18.10. After around two days of running with `pcie_aspm=off', it does not make any difference. I was just forced to do a hard reset of my laptop. Please perform a kernel bisection to find which commit introduces the regression. I just would like to add that I have the same problem about once a day on a DELL Latitude E5550, usually a relatively short while after resuming from standby. It never happens when I boot into the older 4.15.0-39-generic kernel. On a Lenovo L420 that I have updated at the same time, I never had the problem so far. I have the same problem very often during a day on a Lenovo ThinkCentre M900 (see specs below). Often this problem is preceded by Chrome tabs blinking or blacking out but I can't be sure it is a related problem. In those cases, the only solution is to kill Chrome and restart the application. When Ubuntu freezes it starts with either a frozen cursor or unable to use the cursor anywhere. Other times Ubuntu becomes very slow before freezing. I tried Kernel/MainlineBuilds (https://kernel.ubuntu.com/~kernel-ppa/mainline/?C=N;O=D) with my Dell XPS13 (9343). I am now inclined to suspect a Linux Kernel scheduler had caused some of my threads frozen, and X.org console frozen - mouse and keyboard stuck. The latest discover on/right-after X'mas 2018 was that all CPUs logical & physical cores will still be running as seen in ksysguard graphs and top command, while some threads typically my late night crontab backup jobs, HANG FOR HOURS randomly and after hours, RESUME THEMSELVES. The backup was apparently all done - but up to after 12hours of delays! I had also seen frozen X.org screen later refreshed a little after 45mins, but I could not wait further so I SSH a sddm restart as mentioned above. Today my new discovery indicated that we may be heading wrong direction with regards to CPU core voltage and power states. It has got to be something else. I use the famous linux top command and ksysguard (above imgs) and I sort of AMBUSH the problem awaited to solidly catch a process that frozen. My cron jobs put each virtual machines into suspend mode and backup into a harddisk. I got a clue few days ago when I check through my backups, their folder date time stamps suggested that the usual backup jobs which should all be done within 30 mins normally, had on 2 occasions took several hours! There was nothing else wrong beside the long time spent at late night to backup, the data seem quite completely backed up. That means, the lockup or freeze could unfreeze themselves and proceeded to a long delayed completion. So I ssh into this Ryzen machine at my crontab job hour today, forwarded X and ran ksysguard and top at remote desktop. Yes the cron job frozen and backup was not happening. I also used the linux ps -aux | grep crontab & similar commands, it was confirm that crontab was hanging awaiting for vmrun to suspend the vm, and this command just frozen. It fronzen for almost 2 hours! & later it completed it after this long delay. And my script went ahead further to backup another virtual machine, and after backing up, it is suppose to do vmrun resume but agian, the resume frozen up and took more than 1 hour. After this even my ssh -X session died. I can not reconnect again. This happens to me on a clean install with OS updates installed 19/01/01. Some good news and discovery. I had previously also tried 4.18.0-13-generic and found it equally bad. My highest suspicion is 4.18.0-X kernel's thread scheduler is/are buggy with a same bug that would freeze up some threads randomly and up to 12hours long and later randomly unfreeze them. I call that random because I can not find any consistent pattern on how it freeze / unfreeze. These hardly require a hard reset unless it is left frozen for very long time. If I discovered soon enough and gave soft reset by SSH command sudo systemctl restart sddm it will be recovered. It would be gdm instead of sddm if you are in ubuntu instead of kubuntu. My guess for this difference (between requiring a motherboard reset switch vs soft reset command) is that TOO MANY REPEATED THREAD FROZEN OVER LONGER TIME UNATTENDED. It is a guess only because I cannot afford the time to test and prove that. My faithful logical analysis and derivation is so, because this kernel thread scheduler bug will freeze more & more threads than it unfreeze over longer unattended time, and that critical kernel or driver module threads or ssh or bash itself could have been frozen, hence you have no more chance to soft reset / recover. I have proven that when only 1 or 2 threads frozen, servers, ssh, bash, and even ksysguard (CPUs usage / load percentage graphs) will still be running and I never found any single CPU core nor logical CPU (hyperthread) completely stuck in ZERO% usage. When my X.org console freezes, mouse will freeze and CPU usage graph will all freeze, but usually still a good chance if I quickly ssh my favorite reset command sudo systemctl restart sddm it will be recovered. If I wasn't checking and left it frozen for long time, there had been a high chance of it completely not recoverable via ssh command, and reset switch became the only way to get system back rebooted up. From existing state of stability I am optimistic to expect no further debugging on my system for now. I tried kernel 4.20 and 4.15 and keep having freezes. I have a clean install. I used to have 17.10 on this machine without problems. Hello. I had been using Xubuntu 18.04 since May to November, with no problems. This problem began when I upgraded to Xubuntu 18.10, using the Upgrade GUI. I work with my laptop around 10 hours a day, sometimes more, and since I installed 18.10, it freezes between 3 to 7 times a day, sometimes more. I work mostly with Firefox, 5+ tabs open, mostly Google Drive. I also have Dropbox running in the background. It seems to happen more often when I upload an image to a Google Drive file, or while performing a screen capture. Some other times while scrolling on a file, and once while using Atom. I performed a clean install of Xubuntu 18.10 a week ago, and the problem persisted. This happened with kernel 4.18.0-10 & 4.18.0-13. So I downgraded last night to 4.15.0-43, and so far so good, though it's too soon. If it freezes, I'll post back. Today the problem presented itself, twice, with kernel 4.15.0-43-generic in Xubuntu 18.10. Also running into the same issue. It's been happening ever since I installed 18.10. 1. when I use communication software, like Skype or TeamViewer - GNOME here resets and logs me out. I am encountering a similar issue on a new Dell G5 5587. 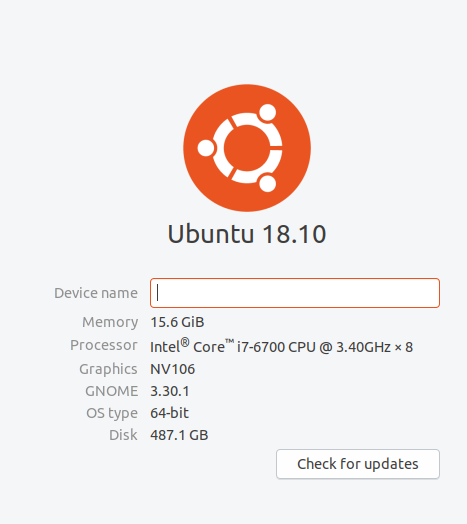 I've installed Ubuntu 18.10 (fresh download today) alongside Windows 10 on a 1TB nvme SSD. I can boot into Ubuntu, but the system hangs shortly after boot, usually less than 5 minutes. I have not determined what specifically triggers the hanging. I have noticed that it does not happen all at once. By that I mean that I lose mouse first (touchpad and wireless mouse), but I can still use the keyboard (sometimes) for a few seconds after the mouse is gone. This makes me wonder if the system is actually frozen or if there is just no HID being recognized. I've also seen the system "lag" input from the keyboard: no response immediately but 30-40 seconds later characters that I typed will appear. I also notice that the fans kick on high, so there may be a runaway processes. In the current state 18.10 is unusable. I haven't even been able tail the log files, I encounter the hang before I have time to troubleshoot the issue. I'm not sure if it's the same issue or something specific to my hardware, I'll update as I continue to try to troubleshoot. I found a solution to my particular issue. DISCLAIMER: I'm not positive that I experienced the same issue as other commenters since the problem was more pronounced than others have been describing. Since this is a new system, this was the first time I tried to install Ubuntu. I'll try to describe what I found in some detail since this was thread seemed like the most pertinent to my issue it may help others. - Select proprietary drivers during install with UEFI boot mode and Secure Boot enabled. I had never used an MDK before, so did not know that you had to elect to "Enroll" the MDK that was generated during the install process. I had expected to be prompted for a password at some point during the reboot based on the language in the installer. There is some user interaction required at that menu to enroll the MDK at which point the user is prompted for a password and then a reboot can be completed. This laptop uses an i7-8750H which (I think) contains integrated graphics. The 1060 should be feeding the display, but I'm not sure if the presence of a second graphics adapter introduced a conflict. I also faced this same bug. I was casting video from my laptop to chrome cast- for about one hour it worked fine and then suddenly video stopped and laptop did not respond at all. It did not take any input. So, I had to hit the power button and switch it off and start it again. -Was using Chrome browser to cast the tab to watch the video online. It turns out that the installation without nvidia drivers and the secureboot option also causes errors. After some time using the laptop, the screen freezes and only holding down the power button allows you to turn off. Unfortunately, after switching on again, there was a problem with the grub welcome screen. I could not even enter the bios settings. There was only a black screen. I had to press the power button several times until I was able to do it after an hour. I have been using ubuntu for several years and this has never happened to me. The problem appeared a week ago on January 23. Previously, everything was fine. Nvidia drivers installed from nvidia homepage. More frequently freezing when working with video inside kdenlive. But had freezes also when only chrome was playing music. Every time it has frozen I have been viewing a Youtube video in Firefox 65.0 (64bit). The ONLY way out is a hard reboot from the power switch. I have now installed nVIDIA drivers because I need to load CUDA toolkit to edit video, but this was freezing up before I installed nVIDIA, right from clean OS install. It is still freezing with the new nVIDIA drivers running. I have the Problem with Kerner 4.15.0-43.
rdesktop sometimes hangs fullscreen and can only be killed via ssh from another pc. With this bug however I cannot restart sddm and after killing rdesktop the screen stays frozen with the rdesktop output. I have been using kernel 4.18.0-15-generic for 3 weeks now, and I haven't had this issue anymore. I'm using this same version of ubuntu. Before crash I've opened new terminal window Ctrl + Alt + F1 and then I 'saw NMI watchdog: BUG: soft lockup - CPU#2 stuck for 23s! [plymouthd:305]'. Result: Still ok after several hours and tasks. I confirmed that 3rpako's settings work for my env too. My env is Dell XPS13 (9343) + Xubuntu 18.10. To reproduce segfaults I downloaded latest Kernel sources and make -j10 them (several times) to get some "realistic" load. Most of compilations failed with segfault. One ended with coomplete freeze and only one or two succeed. After booting with mainline 4.15.0-041500-generic from kernel.ubuntu.com I was able to compile kernel successfuly 3 times in a row. I have newly built PC with Ryzen 5 2600 and I am sure that my RAM is OK. Attached small parts of logs with segfaults and trap messages. Unfortunately I have to revoke my comment #44 - had again two freezes with 4.18.0-16-generic in the last few days. @dode Have you tried #42? @teresaejunior Yes, currently trying it, will report back! I have a freeze issue when it sits unused for about 15 minutes. The issue I found is that the Keychain is using a massive amount of system resources. I have launch a console session with alt+F# (which takes about 5 minutes to show), run top, and then kill the keychain process. Then the system responds like normal. This never happened with 18.04, only after upgrade to 18.10. Is it the same as https://askubuntu.com/questions/1133341/xubuntu-18-10-locking-weird-behavior ? CTRL + ALT + F7 brings the lock window on allowing to unlock. I have encountered this problem on Ubuntu Bionic (running in VMWare Fusion) with Chrome latest open. Chrome will start drawing the page randomly (I've seen that on really old versions of Chrome on Mac). When it starts doing that I can lock-up my OS by doing a `killall chrome` from terminal. When I do that, I can still move my mouse, but clicking doesn't register. I end up having to reboot my VM.